Republic operates gas-to-energy projects at 68 of our landfills. We call these landfill gas-to-energy (LFGTE) projects. This process involves collecting methane, a byproduct of the normal decomposition of waste, from below the landfill surface and routing it to a series of engines. These engines convert the methane into electricity, which can be distributed to the local power grid. Two of Republic’s newest LFGTE projects are in Texas. Combined, our Pinehill Landfill project in Longview and our Blue Ridge Landfill project in Fresno generate enough renewable energy to power more than 200,000 local homes. 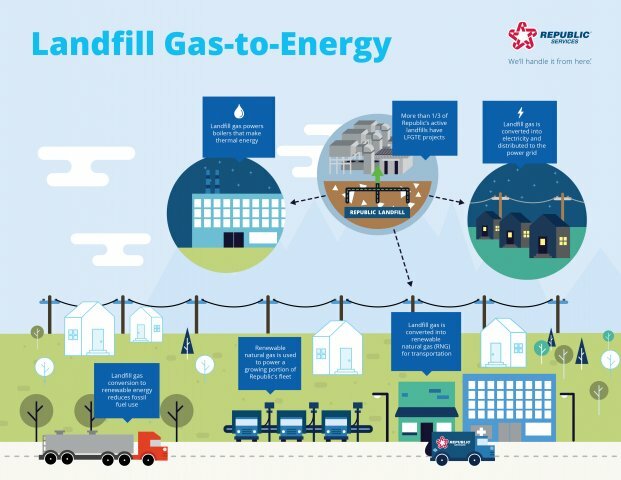 Another type of gas-collection project involves converting captured landfill gas into Renewable Natural Gas (RNG). RNG can be used to fuel natural gas vehicle fleets and has the lowest carbon intensity of all available transportation fuels. The lower the intensity, the “cleaner” the fuel. Using RNG reduces vehicle emissions by 70 percent. Republic Services operates more than 3,500 natural gas vehicles, many of which are now running on RNG derived from landfills. In some cases, the RNG produced at Republic’s landfills is powering our own collection trucks! Republic recently opened a landfill gas-to-RNG project at the Southeast Oklahoma Landfill, outside Oklahoma City. Another project, at Roosevelt Regional Landfill in Klickitat County, Washington, began producing RNG in November. Even after landfills close and are capped, we’re finding ways to use them to create renewable energy. These closed landfill sites, known as brownfields, are being transformed with solar projects, generating enough power for thousands of homes. One of our latest large-scale solar projects is in New Jersey, at the former South Brunswick Landfill. The landfill closed in 1979. After 30 years, the site now is home to more than 40,000 solar panels, which will provide enough clean energy to power over 1,300 homes annually. In 2017, Republic Services invested $29 million in solar projects. As of today, we have built, invested in or operate close to 240,000 solar panels at 19 generating facilities nationwide, with the combined capacity of 80 megawatts of renewable power. To learn more about our Blue Planet® sustainability platform or to download the latest Sustainability Report, visit RepublicServices.com/Sustainability.